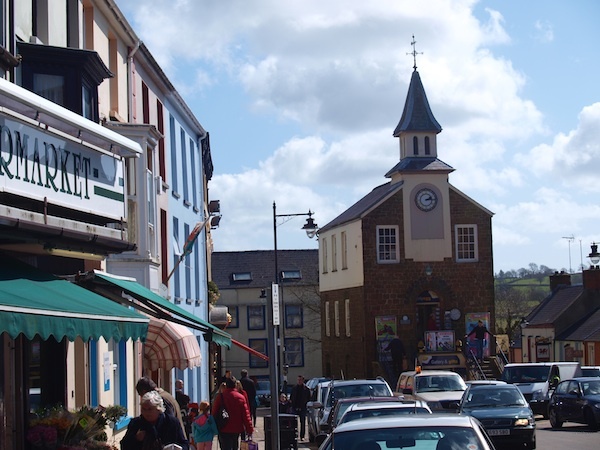 We've just recently been on a holiday, and like so much of my childhood, we went to West Wales, where we came across the little town of Narberth. You may have heard of it, but probably never been there. Its not really on the way anywhere apart from Oakwood park (it calls itself a theme park, but I don't see what the theme is). Pleasantly the high street only contains branches of chain shops, but since they are Cooperative Pharmacy and a Spar. In many respects Narberth would be more at home in the English countryside than the Welsh. There are very few welsh speakers in the shops or high streets and the majority of accents are middle-class english. I overheard one middle-aged, horsey sounding lady answer her phone (rather loudly and enthusiastically) "Hello darling, would you believe - I'm in Wales - haw haw". Recently retired people were being bused in to the town centre which, for a town with not an over abundance of amenities, I found a little strange. There are 6 tea shops on the high street and environs, so that is probably the answer. There were 2 unexpected delights to Narberth, both were food related. The first was an excellent deli and tapas bar, Ultracomida. So many tapas bars are really just bars that serve bar food, which they call tapas in an attempt to appeal to arty, Guardian readers. Ultracomida is so far beyond this. It could easily be taken from the Las Ramblas district of Barcelona. We arrived at 1230pm, expecting a deli with a bar next door. However you have to actually walk through the deli to a room half the size which is the bar. Be warned! Your personal space will be invaded as there are only 3 tables, for everyone to share. There must only be room for 20 people, unless you want to get very friendly. Its worth making some new friends, just don't be wierd and try to talk to them. Smile nicely, like British people do, and then make a polite comment on the decor if you have to get past them. The tapas is as authentic as I have ever tasted, and very good at that. We ordered 2 plates each and the obligatory olives and bread, which made the table quickly fill up like a mediaeval banquet. The little pots of roasted chorizo, potatoes, meatballs et al., don't sound too exciting but were deliciously cooked. Haley ordered a locally produced apple juice, which was incredibly fizzy, flooded the table and most occupants, and provided much amusement for one of our new 'friends'. We booked to stay at The Grove on the recommendation of the excellent Mr and Mrs Smith Boutique hotels, quite unaware of what lay ahead. The hotel has all the appearance of a regency estate, somewhere you might expect an Austen character to come running from the door clutching some correspondence from a gentleman to whom she gave a favourable flutter of her fan. Set a few miles outside of Narberth, it has wonderful views of countryside, and is swamped in peaceful countryside sounds. If you are looking for a hotel which is packed with facilities, give up and go to Butlins. This is a very different affair, where you can sit in the library and be provided with afternoon tea on a butler's tray with a delicious, homemade welsh cake, or downstairs in the drawing room with a glass of port. The real secret that The Grove will share with you, is it's restaurant and head chef. They have recently had a new head chef join them from Raymond Blanc's Le Manoir aux quatre saisons. We were completely unprepared for the smorgasbord that lay in wait for us.We had a gin and then started on our bottle of Rioja before we sat down at table, just after 8.45pm - I was already squiffed. By that time and after going without lunch that day, we snatched up the bread rolls, like rabid dogs at a lazy pidgeon. The wait was definitely worthwhile, the chef had the finest touch I think I have ever tasted. The portions were just right, the blend of tastes was excellent, the selection of local cheeses was generous, as was the accompanying glass of port. We were both very glad that we were staying the night, and stumbled up the stairs in full, contented, tipsy and slightly weeble fashion. Have a gander at The Grove website to realise the full extent of the project they took on when restoring it. Why not book a stay while you're there. Forget B&B's, boutique hotels rule! I was doubtful that anywhere with a name that sounded like a cockney insult would be an appealing place to stay for a couple of night, but it really has some treasures tucked away in its folds. It is worth making the journey, although avoid going on a pensioner bus trip.